Are wetsuits REALLY meant to be this hard to get on? My new wetsuit (can I discuss it if it’s not Christmas yet?) is unbelievably tight. But it passed the comfort test last Sunday at an open water swim session hosted by Masters Swimming Victoria at Elwood beach. Last year my swimming career peaked spectacularly (relatively speaking) when I competed in the Waikiki Roughwater Swim. I say ‘competed’ but that’s overstating it. I jumped in with the rest of the swimmers and hoped I’d make it to the finish line in a time that wasn’t too embarassingly close to the slowest. I really only need a basic wetsuit – one that keeps me warm and provides some buoyancy so I can pretend I’m faster than I actually am. Fourteen years is, I think, long enough to remain faithful to a wetsuit that’s looking a bit chunky and tired. I bought this one from Rip Curl in Torquay in 1999. Yes, it’s still working well enough, and the black does go perfectly with my coloured lycra rash vests. And, as I’ve discovered in the last week, it’s a hell of a lot easier to pull on than a fancy thin-skinned, long-sleeved suit. Here are my instructions for making rash vests. There’s nothing too complicated about them. I’ve added this photo to show how brilliant a rash vest is when you’re snorkelling in tropical waters. Actually I’ve really only used it to add some colour to the page; the rest of the photos are all very duotone. I really don’t enjoy getting into outdoor swimming pools on cold mornings – winter or summer. So I wear tight-fitting, long-sleeved lycra rash vests over my bathers, at least until I’ve warmed up. I started making my own about 13 years ago. One or two a year, plus quite a few for friends … maybe 25–30 so far. Therefore, speaking as the expert I obviously am, let me tell you a thing or two about sewing rash vests. This part is a bit of an overview. In Part 2 I walk through the steps for making a rash vest. The rash vest needs to fit really firmly through the wrists, arms and the bodice so it doesn’t create a lot of drag in the water while you’re doing laps. It doesn’t matter so much if it’s not tight around hips because it’ll ride up a bit no matter what. I recently booked in for a video stroke analysis session with Patricia Baker at Swimwell (www.swimwell.com.au). Pat videoed me from all angles, including underwater, while I was swimming freestyle. And then we sat down and looked at the footage on her laptop and she gave me the bad news. There’s no easy way to admit this: My freestyle stroke is appalling. Arms and hands crossing in front of my head rather than being out in line with my shoulders. Hands tilting inwards as they enter the water – and entering the water way too far in front of me. Elbows not high enough in the recovery position. Right forearm really flat as I pull through the water. It’s no wonder I’m still getting shoulder and neck pain when I train. Happily it wasn’t all completely embarrassing. Pat said my leg and hip position in the water was OK. So it’s just my top half that’s crap. Hey, it works – if you train enough you get fit! This year has been a good one for me swimming-wise. 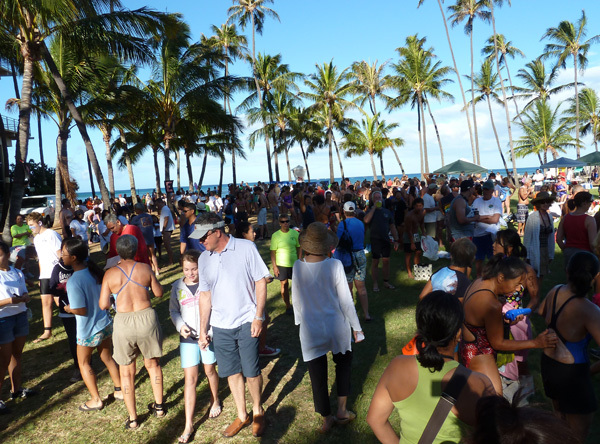 I found a target to aim for: competing in the 43rd annual Waikiki Roughwater Swim on 3 September. Putting in the entry form was the easy bit. Even the training was mostly OK. The hardest part was getting from the hotel to the starting line (oh my god, what was I thinking? Side table, stool or just a giant door stop?